Want a better mood – with less help from drugs? Try increasing the good bugs in your GI tract! The mechanism for benefit may be the ability of your gut microbes to produce butyrate, a short chain fatty acid with a wide range of metabolic effects, including strengthening the epithelial defense barrier , a layer of cells that line the gut to resist invaders like toxins and bad bugs. In fact, it is increasingly evident that a healthy gut microbiome is also associated with a multitude of other health benefits such as better weight management, less cancer, diabetes, heart disease, and more. Now that should help improve your mood! There are many non-drug options for treating depression and anxiety, including targeted diet therapy, fitness, weight management, light exposure, and heat therapy; this study adds powerful support for eating more probiotic foods such as plain kefir and yogurt (meaning unsweetened, with milk and active cultures as the only ingredients) as well as foods like salt-cured sauerkraut and kimchi for a healthier gut microbiome and mood. 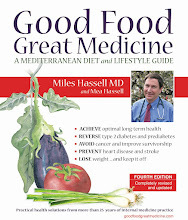 Although there is a subgroup that does very well on medications, be aware that the lifestyle prescription on pages 23-24 of Good Food, Great Medicine (4th edition) is arguably more powerful medicine. For more on how and why to choose probiotic foods, see page 49. There are ongoing concerns that steroid injections for painful knee osteoarthritis [1,2] may have the negative effect of accelerating joint breakdown while having no benefit – including for pain control – compared to placebo injections. This is in addition to data showing that even short-term steroids (as well as other anti-inflammatory medications) have significant potential for harm to overall health. This is an area of legitimate debate; however, given both the uncertainty regarding the benefit and the potential harm, I strongly recommend that patients exhaust all other options before having steroid injections. The alternative is a plan that includes meticulous attention to diet, weight, blood sugar management, appropriate exercise, and topical or oral pain medications. There are some nutritional supplements that may help, and targeted physical therapy can make an enormous difference. Occasionally I use lidocaine injections without steroids and see excellent results.